Ever notice how often we come across people who are well above average or even experts in something only to be below average or almost helpless when it comes to other aspects in life? Or the people who devote their time and energy developing one strength, only to see themselves getting weaker in other areas, often ones they used to be good at? I’ve noticed this over the years and recently started to give it some more thought. How can we explain what we are good at and how does that impact the rest of our lives? 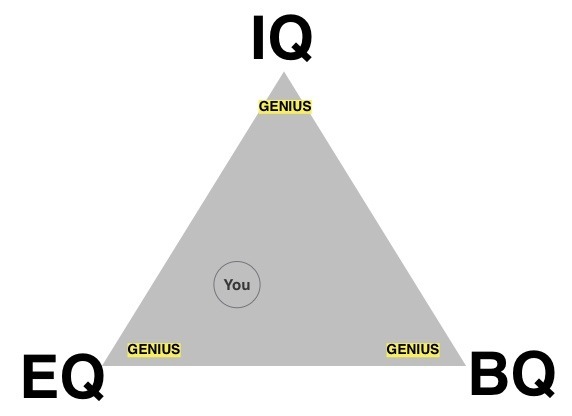 The more I thought about it, the deeper it got, until eventually a fascinating model developed in my head: the Q Triad. 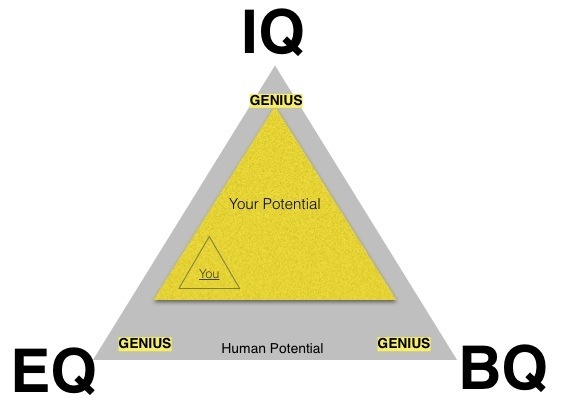 The Quotient Triad- What are we good at and how does that relate to our other abilities? Most everyone knows “IQ”, roughly a measure of intelligence or how smart someone is. In essence, this is a person’s intellectual component, often thought of as book smarts. These geniuses master quantifiable knowledge, data and information. Slightly less well known but by no means obscure is “EQ”, a measure of emotionality or how socially smart someone is. In essence, this is a person’s personality component, often thought of as street smarts. These geniuses master qualitative knowledge, the “feel” of personal interactions, communities and social situations. Almost unknown in a technical or defined way but known intuitively is “BQ”, a measure of physicality or how well movement-connected someone is. In essence, this is a person’s physical component, often thought of as body smarts. Think of athletes, dancers, acrobats. Taken together these quotients measure the basic human experience and skill set. We all know people who are very book smart but not very socially or physically savvy. Similarly we have all come across people who are socially very adept but not extremely smart or physically gifted or the supremely physically talented people with less than average intelligence and social aptitude. As we also have noticed or experienced, many people seem to be more skilled in two of these areas than the third, or occasionally all of these areas. Everyone has a unique dynamic between these three quotients. This observation shouldn’t be groundbreaking or new, as all people have different gifts and talents, either naturally, through training or both. But have you noticed that the more expertise someone has in one of these quotients the less likely they are to be masters, or even average, in the other areas? Why? Because I think human capabilities exist on a 3 way continuum. Each peak of the triangle represents human mastery in each quotient. Most of us aren’t masters, much less geniuses in any of the three areas, and fall somewhere in the middle, with a slight trend toward one or two of the points. So, within the overall human triad, we all have our own “triad of potential” in which we can achieve mastery of with life and training. 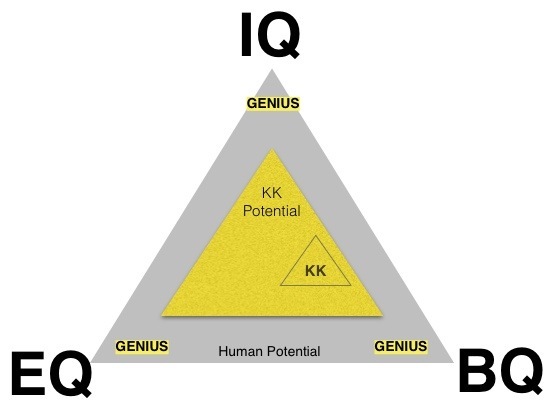 Take the above triad, where person A can achieve personal mastery of BQ, leaving them very good but still shy of human mastery. Also, their potential lies more toward EQ than any other realm which means that even without trying they’ll likely have an aptitude for it. The smallest triangle represents the here and now potential. Each and every day you can perform within your triangle, based on how you’re feeling, fatigue, nutrition, stress, etc. Over time you can move your present triangle of potentional within your genetic potential triad with training and effort. You can also widen or shrink your daily triangle potential with positive training or lack of training. I feel like I have good overall balanced genetic potential but have spent more time developing BQ and IQ, less EQ and so my strength lies toward those areas. 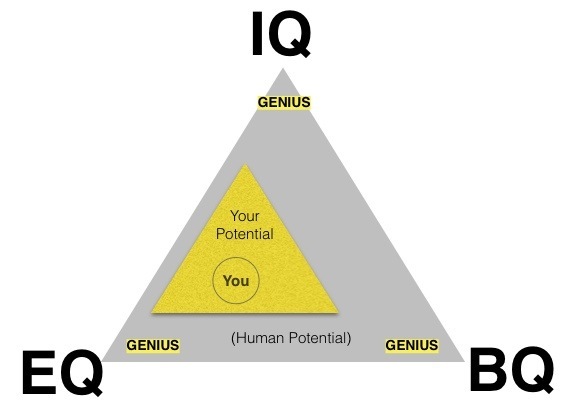 The Q Triad is like a world map (human potential), which encompasses your continent (your potential) and your city (daily potential). For most of human history, your city or local area was all that was possible on any given day. If you wanted to migrate to elsewhere, it took a long time, particularly if you wanted to go from one side of the continent to the other. There would likely be barriers or obstacles (mountains, rivers, weather, predators) that would make the journey quite a process. Your continent was also your limit and it was very difficult to go beyond those shores, just as it’s very difficult to surpass genetic potential. With science and technology it’s now possible to travel to other continents on the globe and we can now use modern advancements that enable us to travel within our continent faster and easier and expand our triads as never before. What does the Q Triad mean? We all have strengths and lie at different points in the triangle. If you want to strive for mastery in one area, know two things: you’ll only be capable of mastery to your potential peak and it will likely be at the detriment to the other areas. If you want to be advanced and well balanced in two Qs, it will be very difficult (impossible really) to achieve mastery of the third Q. No triad position is good or bad or should be considered “ideal”. It is simply where you are and gives you a compass for where you can go and expect to go and helps you see how other parts of your life will be impacted by trying to move your expertise. Lying right in the middle of the triad means you’ll be a jack of all trades but master of none. Pros and cons to this position, which is why some people like it and others strive for more expertise in an area. We also need to keep in mind that everyone has a unique triad layout. Comparing ourselves to other people might not be the best idea if the triads aren’t similar. 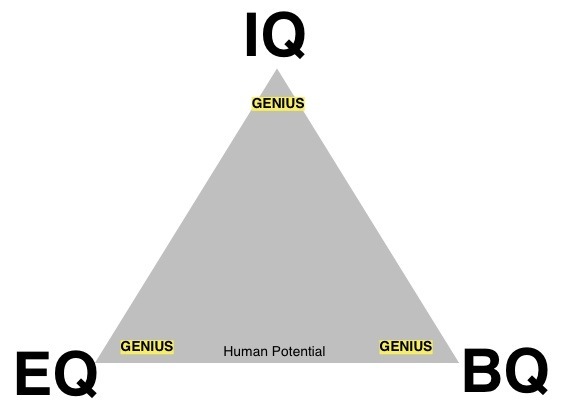 If your triad is IQ biased, don’t expect to have the same physical abilities as someone whose triad is BQ maxed out. The more we keep this general concept in mind the more it can help frame our experience and guide our choices and self analysis. The Q Triad: Just a simple thought experiment and useful guide for approaching and looking at your approach to mastery.